Best of all even if you haven't had a single client you can start using these strategies immediately to capture clients who will pay you $1,500+ for a single project. And if you're afraid of calling or contacting cold you can start the whole process by mail or email. It can't get any easier than that. 've been teaching internet marketers how to get hired by brick and mortar businesses for over 5 years now. And over that time I've seen people try and fail and I've seen people hit it BIG with a whole variety of different strategies. The huge advantage I have is objectivity. At Offlinebiz.com we have over 11,000 members. We have a track record of getting internet marketers from zero to making real money FAST. You can read dozens of unsolicited testimonials here. And best of all I've taken five years of notes on what has worked for them and what hasn't worked. Why be someone else's guinea pig when you can start today using proven strategies to bring in the paying clients you need to explode your income? That's why I've put together 5 years of experience and live testing to create the 80 page Offline Gold report "25 Different Ways To Get Paying Clients". 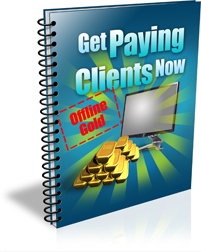 In this report I reveal more strategies than you'll ever need to land paying clients. The amazing strategy I sold to one of the world's leading marketers as part of a package for several thousand dollars. He was amazed when he realized it was exactly what I did to get him as a client! And best of all you can start using this strategy today with email. It's so simple it will literally blow your mind. Why the people you've been seeing as your biggest competitors might be a gold mine to you and how to tap that gold mine. The Out Of The Box Referral Strategy that can turn any influential contact you have into a gold mine of clients. The simple sentence that can multiply the referrals you get to high paying clients. This is so obvious you'll kick yourself when you read it. That's right you don't have to call people to get the ball rolling. I even give you a full document filled with 15 plain text email templates. You can quickly adapt these emails, add your name and you're ready to send them...right NOW. No more sweating over the phone, or trying to pluck up the courage to walk into a business. The business owners you'll talk to have already contacted you wanting to know more. Nothing could be easier than just sending out some more emails or letters every time you need some more paying clients. Once you get rolling with the marketing system outlined in this report you can turn the flow of customers on and off like a tap. Best of all it won't cost you a cent extra to get customers flooding into your business while other businesses around you are struggling to get anyone through their doors. The amazing "Charity Magnet" strategy. You can be picking up high paying clients while you help out your favorite charity. And you can get this started with a simple email. A breakthrough in the way you think about business networking groups and the "Follow the Leader" strategy that can bypass all that hand shaking and put you at the front of the line with every member of the group who is a prospect for your business. Even if you have NO internet marketing skills at all you can use this simple strategy to get started today making an income. Imagine talking to a business owner and never having to answer a difficult question (or ANY question) if you don't want to. And making them even more eager to get work done. That's just one of the amazing side benefits of this method. And if you do have some skills but you'd like to get paid more for doing less then this strategy will revolutionize your business. How to harness the "CNN Calling" strategy to eliminate cold calls and have business owners eager to get face to face with you for an hour or even longer. The powerful "Snail Magnet" strategy that can turn a prospect who doesn't know you from Adam into an eager client ready to pay premium fees for your services. A simple change you can make to any letter that will multiply the number of people who read it and call you back. Where you can download a simple free program and how you can use it to get prospects salivating at the thought of hiring you. How the "Let's Party!" strategy can turn prospects on the fence into clients who will do business with you for years to come and send you every referral they come across. And why the outrageously simple "Breaking Bread" strategy can completely change the way prospects and clients think about you (and turn them into ardent fans of you and your service). To Get Paying Clients Audio"
I got onto Skype with Patti Massullo, our coach at Offlinebiz.com and spilled the beans on as many of the strategies as we could jam into a two hour call. I should warn you the audio quality isn't fantastic but the quality of the information is amazing. If you land just ONE new client at $500...way below the kind of fees you should be charging...you'll make back the price of this package 16 times over. And remember you can get started using email so you KNOW you will take action on a pile of the strategies you'll find in this package. If you're not thrilled with the information packed in this report and audio just let me know any time in the next 60 days and I'll refund 100% of your purchase price. But you must act now. At $29.99 the strategies and resources revealed are outrageously underpriced. The price must go up soon to reflect the real value of this package. I'd really hate to see you miss out. P.S. Remember you can literally download this product and start emailing prospects within minutes. No more pressure looking at a phone you have to pick up or standing outside a business trying to convince yourself to walk in. Finally you can take control of getting all the clients you need to make the income you dream about. Why struggle to earn a living when you can create an explosion of income so easily?